Humphrey School MPP students Camila Fonseca Sarmiento, Bettsy Hjelseth, Rebekah Nelson and Evan Hramada completed a program evaluation of the Namibian Empowerment and Equality for the Deaf through Skills-Transfer, Mentorship, Education and Technical-Training Program (NEEDS-MET) for the Namibian National Association of the Deaf (NNAD). 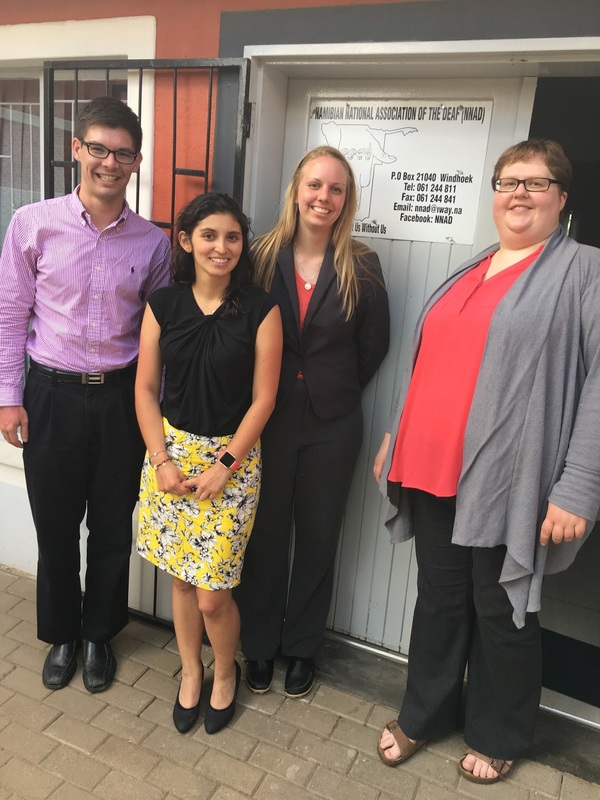 The evaluation team traveled to Windhoek, Namibia over spring break to conduct their research. They found that the program had a low rate of goal attainment despite NNAD's strengthened organizational capacity, committed staff and increased stakeholder cooperation. The evaluation team recommends the organization: Focus on organizational capacity which will improve their use of resources, stakeholder relationships, and the implementation of future programs; create a clear communication protocol that will better include stakeholders and allow for increased project feedback; and increase leadership skills with the aim to improve management structure, thus making the implementation of future programs more efficient and effective.